As frugal living becomes the new "black", I've received quite a bit of mail from readers asking how to do their hair in chic n' cheap styles. All over the world, people are cutting back on expenses. And part of this scaling back, is looking for new ways that we can style our hair. Speaking for myself, I am afraid to cut or highlight my hair at home. However, I know some of us are currently doing this to save money on salon visits. It's great if you can do it. I'm more comfortable finding some basic styles I can do myself, and some products to help me keep my hair in "tip top" shape. To research this area, I called my stylist David Jensen at Santa Monica's hip celebrity boutique salon, The Shampoo Lounge. The Shampoo Lounge is discreetly tucked away on Pico Boulevard a short distance from Shop Intuition. David was full of great information and sample ideas for easy summer styles. Following is my interview with him and some pictures to illustrate his tips. Listen up Bargainistas! Q. What are some of the current hair style trends that you've seen? Popular looks? A. David, The Shampoo Lounge: I am seeing a lot of braids; they are quick and easy for everyone to do with just a little practice. This is an easy and chic look. I'm seeing more braid styles turning up on celebrities and my clients. Pictured: Linda McCartney's Band on the Run "accent braids" from an old Wings album cover. Pictured: Actress Anne Hathaway's braid up do, a new twist on an old favorite. Pictured: Actress Jennifer Anniston's braid accent at the Academy Awards this year. Q. Any styles that you recommend that are particularly easy to care for ? Q. What are some simple tools that you recommend Recessionistas keep in their Hair Care tool box? Outshine is great and gives a nice conditioning treatment. I recommend using this when it is dry due to Southern California's Santa Ana winds or being inside with air conditioning. In the summer, beware of AC as it does dry the hair out. Fabricate is the best for giving support to a heat set. If I am going to take the time to curl hair with a curling iron or hot rollers, this product gives great long lasting shiny curls and works fast. Using rollers at home or curling iron is a good way to give yourself a special hair look at a low cost. Just make sure to use a product like Fabricate to get the most of our your curls. I recommend Redken's Rough Paste for fine hair when you want a little volume without teasing. Q. Any secret products for men? A. 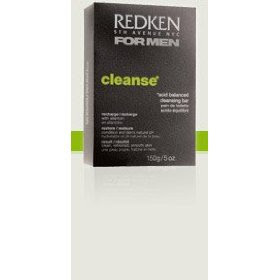 Often over looked, but a classic, is Redken's Cleanse bar for men. It smells great. Men tend to shower a lot and Cleanse keeps the skin clean but not tight and dry. And at under $8.00 US, it is a great price. Q. For a special evening out, what would you recommend? An up do? A chic blow dry style? A. For an evening out the pony tail seems to be the new up do. I recommend doing your ponytail up high and then pulling it tight so the hair volume is at the crown. Pictured: Keira Knightley looks tres chic in a ponytail and Roland Mouret dress. Pictured: An easy high pony tail style. The look is swept back in a colorful clasp. 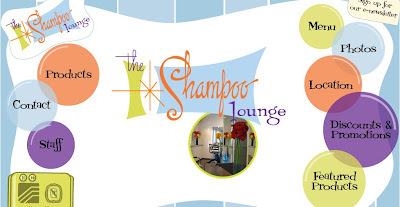 For more information, and some discounts, visit The Shampoo Lounge website. If you live in the Los Angeles area, check out their Happy Hour promotions. There's nothing better than a little hair care, some gossip at the salon and a great Cosmo-tini!